To start off, let's compare the two new logos of the inaugural seasons in the new Mets and Yankees Stadiums. First is the Yankees. Stately, regal. Everything it should be when you're opening up a new baseball cathedral. Now the Mets logo. 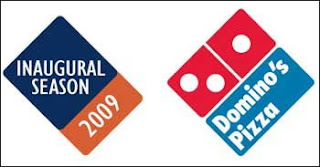 And as you can see, from the logo comparison via a Met's blogger's web site, it looks like a place to get pizza, quickly. Like Shea Stadium, the 15 interchangable uniforms and seemingly everything about the Mets....it misses the mark. Second....what a weekend of football. 3 out of the 4 home teams lost. And the two number one seeds lost. Incredible. Now only if college football could have a playoff system like this.....how great would those games be? One more thing about the playoffs....how dang good is Larry Fitzgerald. It's like he's a college star playing with pop Warner kids. The real deal he is. So a guy who batted .247 last year, .236 the year before and .253 the year before that, and has a history of injuries gets a 1-year 5-million dollar contract? He fields first as well as my mother and has the same throwing style as her. Sure, Jason Giambi can still thump the ball sometimes, but his slugging percentage is .502 and and .433 the past two years—not bad, but not exactly Ruthian. I suppose the A's think pairing him with Matt Holliday might get the best out of ole' Jason, and if his name sells a few tickets out in Oakland, I guess, so much the better. Hilarious move by McNabb running to the Giants sideline and grabbing a phone and making a fake phone call. Ha, Ha Ha Ha Ha Ha Ha!!! What a card. Would have loved to see Donovan try that prank with Jack Lambert or Mike Singletary playing and seen how they reacted. My guess is McNabb wouldn't have been playing this week due to his own foot up his wazoo. Interesting article in the Tennessean today regarding Vince Young. Here's what they wrote about the offseason and Vince Young. ...Vince Young, the third overall pick of the 2006 draft has three years left on his Titans contract. He's scheduled to make an affordable $2.16 million in 2009, but his salaries increase to $7.5 million in 2010 and $8.5 million in 2011. Young is facing a very important offseason, Jeff Fisher said. "We expect a 100 percent commitment from Vince. We'll accept nothing less than that,'' he said. Might turn out if Vince doesn't have his head screwed on straight that the 2006 Rookie of the Year might be out of work by the end of 2009. Is it me, or have the Jets interviewed seemingly 30,000 people for their open coaching job? Which begs the question...where the heck is my phone call. I have some ideas for the Jets offense. A little pat on the back to myself for correctly guessing last November that Rocco Baldelli would/should go to the Red Sox. And congrats Rocco, hope everything works out for you. And lastly, congratulations to Rickey and Jim. Well done, guys. And to Tony Dungy—thanks for a great career, and being a class gentleman the whole time. Enjoy the time you have now, Tony. The one year deal for Giambi doesn't perplex me as much as the 3 year $30 million that Milton Bradley got from the Cubs. A guy who has only played more than 100 games 3 times in his career and before last season in Texas played: 75,96, and 61 games. Plus Texas only played him 20 games in the field and Chicago will expect him to be and everyday outfielder. His career has shown that he can't really do that.